I know this seems like a strange gift but I actually like to buy shopper bags to use as gift bags as they can actually be used again by the recipient afterwards and this Last Jedi one from the Disney Store is a really nice quality one - the images on the front are actually lenticular art! I have a pair of the Disney x Stance socks and they're without a doubt the nicest quality socks I own so these are definitely worth the price tag! Alice Vitrum have some of the loveliest Disney and Star Wars merch but this Porg pin has got to be one of my favourite designs of theirs! It's on pre-order at the moment so it won't arrive until after Valentine's Day but at only £5 it would make a lovely little add-on present to surprise them with after. If the art on the cover of this book is anything to go by then this book looks like it will be a beauty! 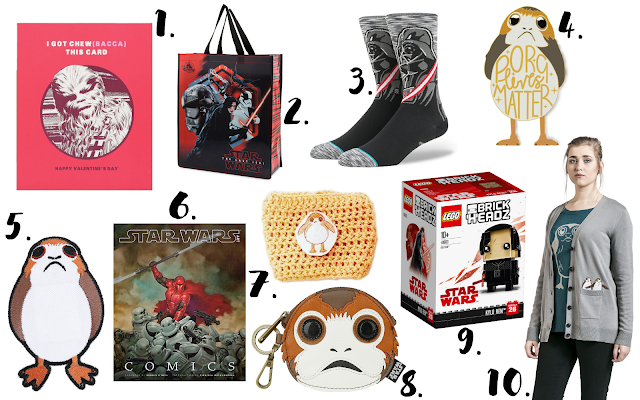 If your partner is a fan of Star Wars comics then this would be the perfect gift. Is this not the cutest coffee cozy you've ever seen?! I actually have one of these myself and it's such great quality and incredibly adorable - a great gift for any coffee-loving Star Wars fan! Plus if you use the code "COURAGE10" you can get 10% off! I usually include a Funko Pop in almost every gift guide I do as they make great gifts and are very reasonably priced but this time instead I'm recommending these LEGO Brickheadz! These would be a great addition to your partner's work desk or as a little decoration around the house. I have a feeling I'll be treating myself to this Kylo Ren one before long to add to my shelves! Hope this helps anyone who was a little stuck for inspiration!